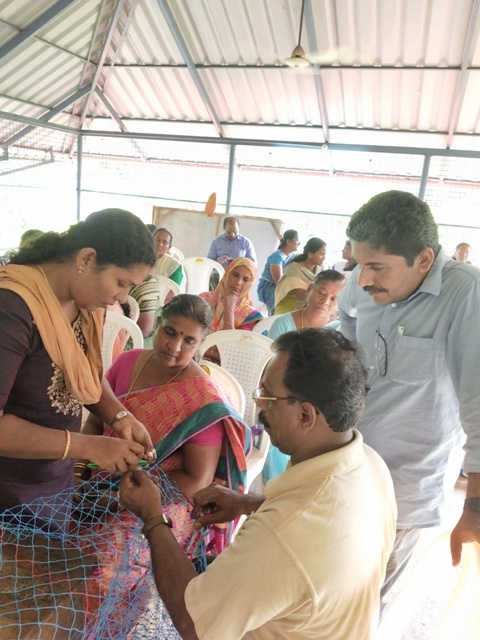 ICAR–CIFT, Cochin, in collaboration with The Kerala State Co-operative Federation for Fisheries Development Ltd( MATSYAFED) has conducted a three-day long skill development programme on “Value addition of fish and fishery products” during 14thNovember to 16th November 2018 at Cherai village and CIFT. 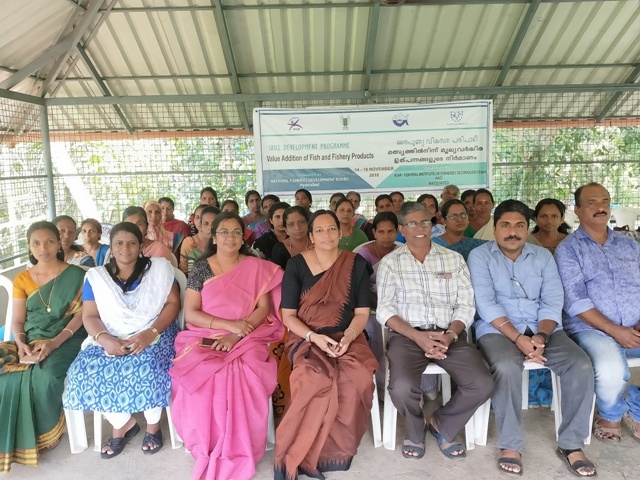 The programme, conducted with the assistance of National Fisheries Development Board, Hyderabad was attended by 24 participants from coastal areas like Cherai, Munambam, Edavanakkad, Malipuram etc. Shri A.B. Shaji, Cherai Fishermen Co-operative Society inaugurated the programme on 14th November 2018. Mr. George, Manager, Matsyafed, Ernakulam District offered felicitations on the occasion.Sessions on hygienic handling of fish, nutritional benefits of fish consumption,drying, handling, preprocessing, drying using solar dryers, quality evaluation and packaging, waste utilization, fish for alleviating malnutrition, entrepreneurship development, anti-microbial resistance and personal hygiene were conducted under the programme. 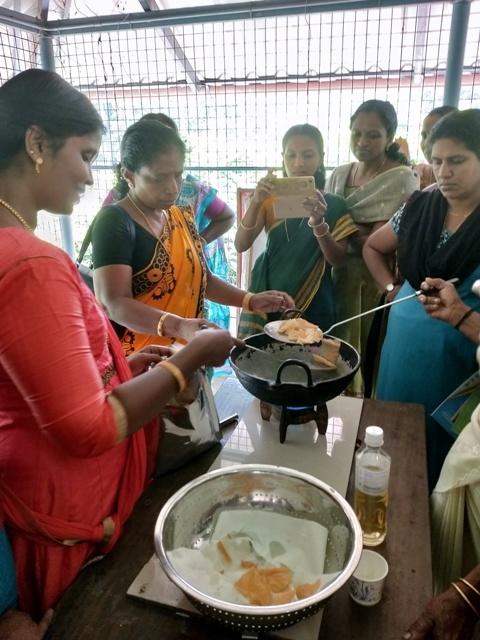 Preparation of value added products like fish papad, fish soup and hygienic drying using solar dryers were demonstrated. Valedictory function of the programme was conducted on 16-11-2018 at 3.00 pm. Shri.K C. Rajeev, Board Member, MATSYAFED was the chief guest of the function. The chief guest pointed out the importance of translating the learning to action and offered all the support from MATSYAFED in the future endeavors. He also appreciated the effort of CIFT in reaching out to the fisherfolks with innovative technologies. All the participants expressed their satisfaction at the end of the training programme. Participants demanded more trainings in the same line. Some of the participants expressed their willingness to initiate small scale enterprises based on the learning from the proagramme and by further updations. The certificates of participation were distributed by the chief guest and other resource persons. Dr. Suseela Mathew, Head Biochemistry and Nutrition Division, CIFT and coordinator of the programme appreciated all the participants and Matsyafed officers for their wholehearted support during the programme. 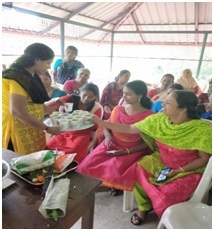 She urged the participants to make use of the learning in their day to day life and to initiate small scale venture. She assured the support of CIFT in providing technical know how related to value addition of fish and fishery products.